Discovering the world through exotic rock 'n' roll. Friday, April 7, 9 p.m. Since I got my first album when I was 4, I didn't understand much of what Kiss was talking about—like what they meant by, "Meet you in the ladies' room," what they intended to do in there and why, exactly, there was a room for ladies. That's OK, though, because I still connected to the rhythm and melody, the sound of the cowbell, thumping basslines, distorted power chords and powerful vocals. Music is a language we already understand intuitively. Exhilarated by these sounds, I jumped on my couch and ran around the apartment. When we're infants, we pick up language by hearing it spoken. First we hear gibberish, and speak gibberish, and glean meaning from expressions and gestures and learn to associate words with people, objects, actions and emotions. As I aged and learned new words, phrases and concepts, the songs revealed more with each listen. The world became clearer. Over time, I learned what business Gene Simmons had in the ladies' room, where boys weren't allowed, even if—eeeewww—they wanted to be there: He was gonna give the lady the business. As an adult, the journey from discovery to understanding is accelerated. It's also harder to connect to music. Sometimes I'm looking for something more specific to my mood or circumstances. I want it to sound a certain way, but I often can't articulate how. Recently, I realized that I crave the old rush that comes from the unfamiliar. The epiphany came in November, the day after I saw the Mexican band Cuca. While I speak decent Spanish, reverb and deficits in my knowledge of the language meant I couldn't understand much of singer José Fors' stage banter or lyrics. I relied, as when I was young, on tone, gestures and intuition. Yet it's one of the best concerts of my life; I left feeling energized and satisfied, thinking that this must be how the Japanese audience felt when Cheap Trick played Budokan. They didn't need to know what "High Roller" or "California Man" meant; they connected to Robin Zander's soaring rasp and Rick Nielsen's bouncy guitars. But, man, were they jumping around. I have a fascination with Mexico and the Spanish language, so of course I love rock en Español. Although it's essentially the same American blues-based rock music I grew up on, it has, as John Travolta said of Amsterdam in Pulp Fiction, "little differences." It's not hard to grasp what local band Leyenda Oculta means in "Viva El Rock 'n' Roll," but when Gabino Ramirez rolls the "r" in "rock," there's a power and strangeness to it. I can't make that sound. I don't understand all the lyrics. But I feel the music, and it gets me jumpy. My music collection is organized like a record store, by genres. Although the world music section is dominated by Latino acts, I also have music from Africa, Tibet, Tuva, Cambodia, Brazil, Thailand, France, Germany, Scandinavia, Russia, Japan and Italy. I also have Native American music and Australian didgeridoo collections. While some is purely traditional, and I get a thrill from all of that, I'm especially fond of the rock-based stuff, seeing how it translates in other cultures. A favorite is Albert Kuvezin, a Tuvan musician best known in the states for his covers of Joy Division, Led Zeppelin and Motorhead songs that employ Tuvan throat-singing and traditional instrumentation. He's also been part of the rock bands Hartyga and Yat-Kha, where he sings in Tuvan backed with instruments such as the khomus (Altai mouth harp) and morin khuur (Mongolian horsehead fiddle). A song like Hartyga's "Megechi Kham," then, might have a familiar, stomping 4/4 beat, but guttural, single-voiced harmonies, mysterious lyrics and exotic tones are exciting—a reminder of how big the world is, and how much there is to learn. Two bands playing Salt Lake City on Friday night evoke similar reactions. Tinariwen, from the Saharan region of Mali, plays an intoxicating blend of West African and Tuareg assouf music, with a generous helping of electric guitar. The cinematic, groovy tunes earned the group a Grammy Award for their 2011 album Tassili (Anti-) and, particularly if you know the nomadic nature of the Tuareg people, it conjures all kinds of fantastic imagery. 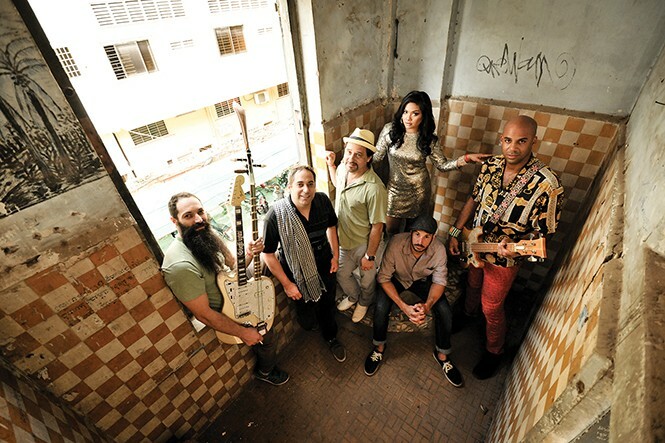 Dengue Fever, although from Los Angeles and mainly comprised of Americans, blends psychedelic rock with Cambodian pop music. The music is as trippy and febrile with vocalist Chhom Nimol singing in her native language about a "Ghost Voice" and the "Deepest Lake on the Planet." I've yet to see either band live. A chance to see them both on the same bill—on the same night that Liquid Joe's hosts an outdoor rock en Español concert—has me feeling pretty froggy.